Slate Digital’s VerbSuite Classics is the first third party plug-in to use the Fusion-IR processing technology. It includes models of eight of the most popular professional digital reverbs from the past forty years can be accessed in a single plug-in, some of which have never been modelled before. What makes VerbSuite sound different from other available reverbs is LiquidSonics proprietary Fusion-IR processing, which captures the actual tone of the modelled reverb for the first time. 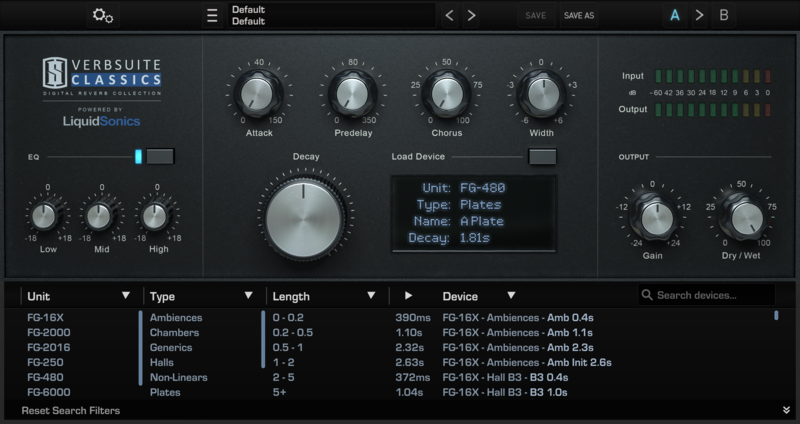 Unlike static impulses found in typical convolution reverbs, Fusion-IR is able to reproduce the evolving character of modulating digital reverbs, making the overall tone rich, smooth and dynamic. Available for $199 or as part of the everything bundle directly from Slate Digital. The LiquidSonics Bricasti M7 Fusion-IRs are made available as a free expansion pack.